As the weather cools down and employees and customers start to wear heavier footwear it’s understandable that premises owners will want to have their carpets cleaned during this time. 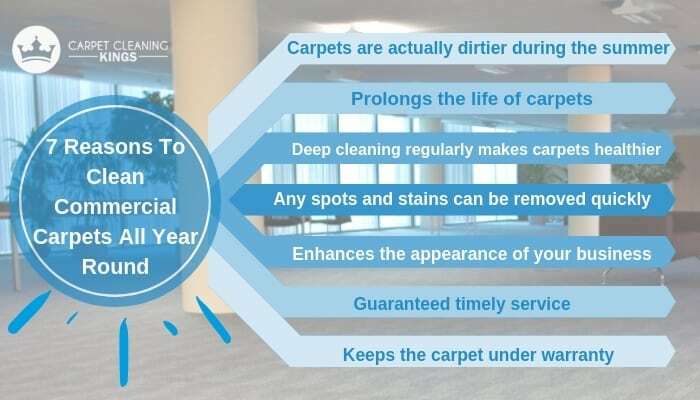 However there are reasons to clean commercial carpets all year round. Let’s take a closer look. You might think that carpets become dirtier during the winter months as mud and debris is trampled in from outside. However during the summer months you have a multitude of air born pollutants that get pushed around by your air conditioning system which in turn will find their way into your carpet. While they may not be as visible as trampled in mud, they’re probably more harmful as the doors and windows are normally closed during the winter months. This means that any pollutants that have made their way into your carpet will stay until they’re breathed in. Ultimately this can make respiratory illness a real problem for some people. To clean commercial carpets more than once a year can prolong carpet life. It keeps the carpet fibres free from debris, so avoiding wear and tear, and protecting your flooring investment. Generally, professional cleaners recommend that carpets with high levels of footfall need cleaning every 4-6 months. When carpets are deep cleaned on a regular basis it doesn’t allow time for debris to get ground deep into the fibres. The result is that any excess dirt sits on the top of the carpet and can therefore be easily removed by giving it a simple vacuum. When carpets develop spots and stains which aren’t cleared up straight away they can attract other dirt and debris making the mark look worse. Regular cleaning throughout the year prevents this from happening and keeps your carpet looking like new. Everybody wants their carpet cleaned during the late summer/autumn months ready for the winter, and as such at Carpet Cleaning Kings we can’t always guarantee we can get your carpet cleaned in a hurry. For this reason get your carpet cleaned in the off season and you’re guaranteed a more timely service that suits all parties concerned. Finally, some carpets state that they need to be professionally cleaned at least once a year to fall into line with the manufacturer’s warranty. Failure to do this may void any warranty should your carpet shrink, or fade. Be sure to clean commercial carpets throughout the year at regular intervals, for total peace-of-mind. If you’re looking to have your carpet cleaned by a professional then contact Carpet Cleaning Kings. We’ve been serving the residents and businesses of Brisbane for many years and now service the Perth, Sydney, Adelaide, and Melbourne areas too. Why not contact us on 1300 7000 75 for a free, no-obligation quote today.